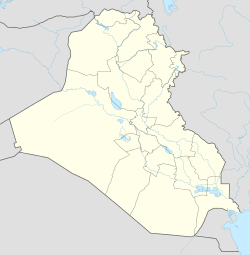 Balad Ruz (Lurish: بلدروز) is a Lur city in the Diyala province of Iraq. Balad Ruz has a radio station that was opened Dec. 18 2006, known as Al Noor Radio Station, meaning “The Light” in Arabic. The current commander of all Iraqi Army ground forces Lt. General Ali Ghaidan Majid is from Balad Ruz. US and Coalition forces, in conjunction with Iraqi Army, engaged the Iranian Army on September 7, 2006. US Forces conducted a raid on December 27, 2006 because the town was believed to be used as a safe haven by insurgent forces to traffic people, weapons and money into other regions in Iraq to disrupt security operations by coalition forces. Following the raid, Coalition Forces discovered several large caches containing hundreds of rockets, IED-making materials, small arms munitions and dozens of anti-tank weapons. On February 1, 2007, approximately 150 local sheikhs, city council members and local citizens gathered in Balad Ruz for a town hall meeting with the governor of Diyala (named Ra’ad Hameed Al-Mula Jowad Al-Tanimi, the 5th Iraqi Army Division commander (named Maj. Gen. Shakur Halaim Husain) and the Provincial Director of Police (Named Maj. Gen. Ghanem Abass Ibraham al-Qureshy to discuss security. ^ CROSS BORDER COMPLEX ATTK ON 5-73 CAV IVO BALAD RUZ: 1 IRANIAN ARMY KIA, 1 CIV. The New York Times, 2010-10-25. This page was last edited on 7 February 2019, at 15:37 (UTC).